A splendid exhibition variety of golden merit producing large globe shaped onions with a rich, golden straw coloured skin. 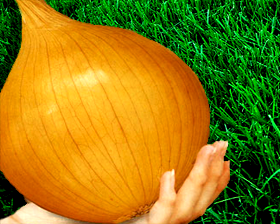 As well as being a super show variety, Onion Exhibition is also one of the best varieties for general cultivation producing up to 1kg large onions with an excellent mild flavour. Early sowings in trays can commence in January to February under heated glass to plant outdoors in late April or May. Outdoor sowings can be made in a prepared seedbed in a sunny, sheltered site during March to April. Sow seeds thinly, 13mm deep, in drills 30cm apart. Lightly cover the seeds with soil, firm gently and water if soil is dry.